USAs största dropp i BNP där det är endast Q1 2014 som inte är i recession. Måste bero på vädret!!!!!!! A rather thought-provoking chart which we've been looking at is the ratio of the SKEW (the chance of an extreme or outlier event, i.e. OTM versus ATM options) versus the VIX (the expectations for more 'normal' day-to-day volatility - the price of hedging implied by ATM options)... and is an indicator of how the market is pricing the possibility of a potential black swan event. You can see how extended we are right now… (actually at record highs). Har silvret brutit den 3 åriga nedåtgående trenden. Veckan kan avgöra med optionslösen. Det är stökigt i den här regionen och värre kommer det att bli. FED kallar stigande matpriser för Noise. Skall bli spännande och se vilken BNP deflator som kommer att användas när dom beräknar BNP för Q2. Yellen ser ingen bubbla i aktiemarknaden möjligen skall hon börja med glasögon. As you know, Sprott has won mandates from a variety of Asian investing entities. Visiting with them and going to speak at a conference in Hong Kong just reinforced the need that Asia has for resource related investments, which will most likely be in place for the next 10 years. The difference in sentiment between the conference I spoke at in Hong Kong and the conference I just spoke at in Vancouver was really noticeable. The Asians view this as an incredible opportunity to get involved in the sector, whereas in Vancouver you could feel the mood was downbeat. We both know that the summer is generally very soft in junior resources. My suspicion is that we are now entering a period from now to September that is perhaps the last good buying opportunity in the sector. So that's what I'm focused on. I'm looking for bargains and looking to deploy the money that Sprott has been successful in raising over the last year. Har FED koll på detta när dom har sitt samkväm och vad gör dom åt det. "The index for meats, poultry, fish and eggs has risen 7.7 percent over the span [last year],” says the BLS. “The index for food at home increased 0.7 percent, its largest increase since July 2011. Five of the six major grocery store food group indexes increased in May. 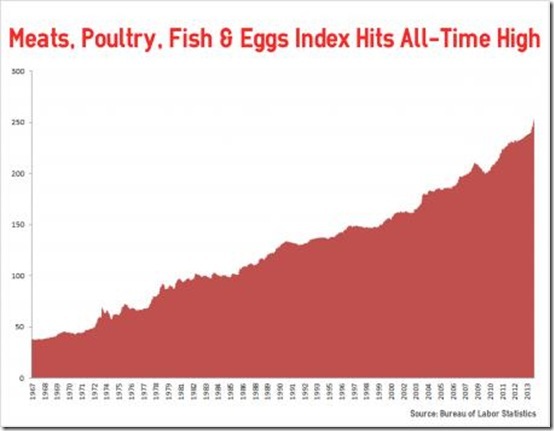 The index for meats, poultry, fish, and eggs rose 1.4 percent in May after a 1.5 increase in April, with virtually all its major components increasing,” BLS states. UKs gaspriser steg 7% eftersom Ryssland och Ukriana inte kan sätta priset rätt. Det här börjar likna 70-talet med stagflation p.g.a. höga energipriser. Bytesbalansunderskottet för Q1 i USA blev det högsta sedan Lehman krisen. Hur står det till med ekonomin. Obligationsräntan gick upp på högre inflation än väntat är nu på väg att bryta den nedåtgående trenden sedan början på året. Gas pipeline i lågor nära den Ukrianska staden Poltava. När kliver Putin in i Ukriana men sin arme? An explosion has struck a pipeline near the eastern Ukrainian city of Poltava. Witnesses say the flame is reaching 200 meter high, RIA Novosti reports. The Urengoy–Pomary–Uzhgorod natural gas pipeline is about one kilometer way from the nearest settlement. No victims have been reported. Fire fighters crews have been deployed. Relations between Russia and Ukraine have entered a new stage and are "moving closer towards a serious conflict", said State Duma Foreign Affairs Committee chief Aleksei Pushkov. Russia did not recognise unilateral border demarcation by Ukraine which was "contrary to all norms of international law", Russia's ITAR-TASS news agency quoted Pushkov as saying Tuesday. "An attack on the Russian embassy, an attempted attack on the consulate-general in Odessa, insults to the Russian president, regular arrests of Russian journalists -- I think this is a deliberate decision co-ordinated with the U.S -- all these are links of one chain," he said. Inflationen högre än väntat och FED har nu arbetslösheten och inflationen på nivåer där det inte krävs några stimulanser. Kommer vi nu få se en snabbare nedtrappning av stimulanserna. Does this look like the Fed has inflation concerns under control? Central banks runt om i världen har investerat ca $29 trillioner i aktier och andra investeringar. Vi har därmed världens största pyramidspel och inte fria marknader. Central banks around the world, including China’s, have shifted decisively into investing in equities as low interest rates have hit their revenues, according to a global study of 400 public sector institutions. “A cluster of central banking investors has become major players on world equity markets,” says a report to be published this week by the Official Monetary and Financial Institutions Forum (Omfif), a central bank research and advisory group. The trend “could potentially contribute to overheated asset prices”, it warns. The report, seen by the Financial Times, identifies $29.1tn in market investments, including gold, held by 400 public sector institutions in 162 countries. Formaterar vi nu en head and shoulder för guld. Kommer vi in i juli ser vi stor potential för guldet. Given the build up in short positions, the shorts must be getting very nervous. 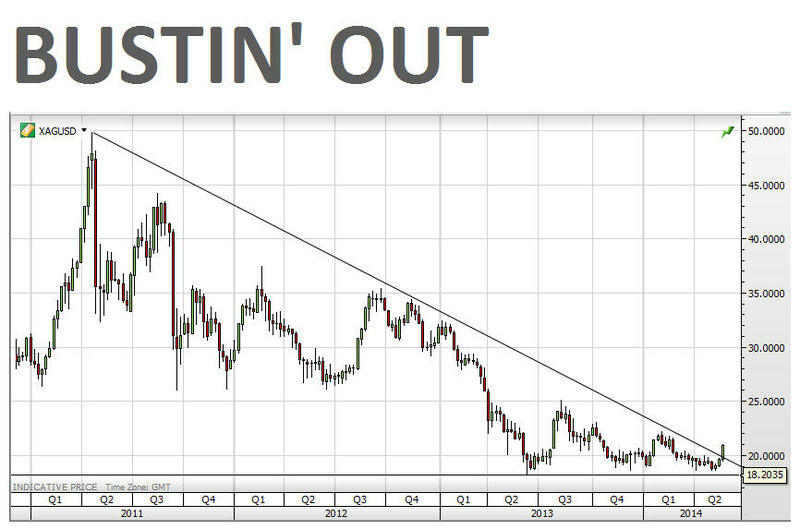 A significant short squeeze is a real possibility, particularly in silver. 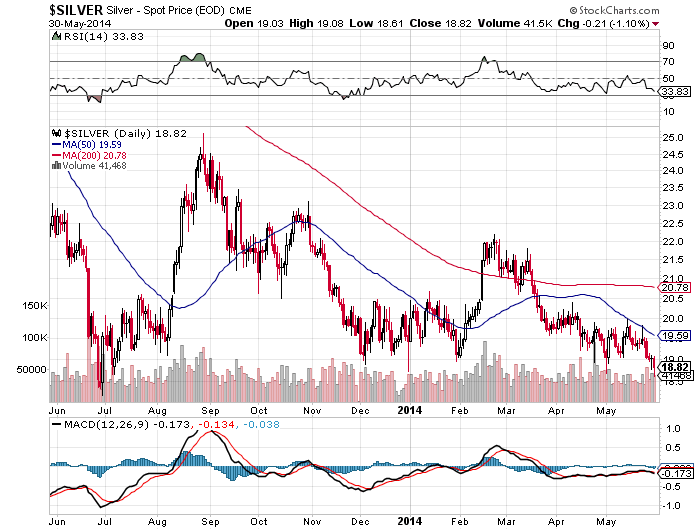 The open interest on Comex silver has been growing for months as the shorts pile on, recklessly in my view. 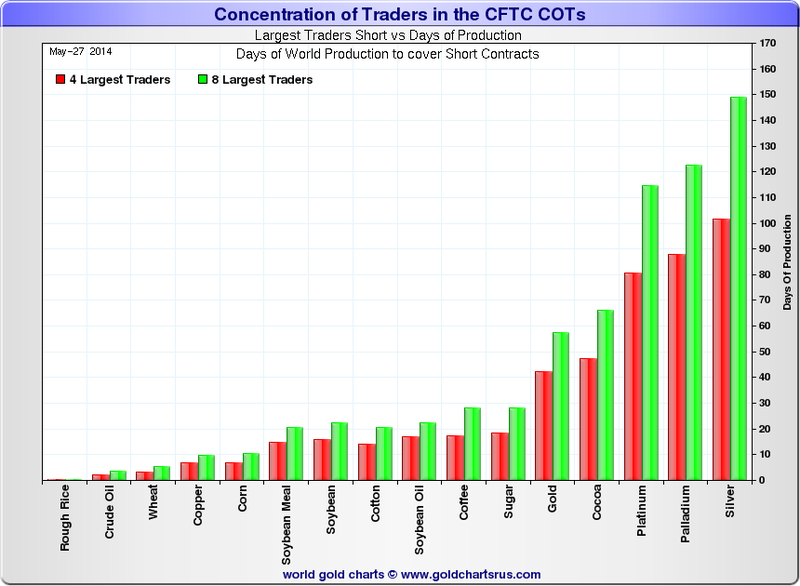 The short position in Comex silver futures alone is almost equal to all the silver mined in a year, and Comex silver futures are generally believed to be less than 20% of the total global derivative position. The imbalances at present seem so huge, that I would not be surprised if we get a repeat of the Volume Investors Inc. collapse. That firm went belly up in 1985 when they could not cover quickly enough their huge short position in gold, which not only wiped out the firm’s capital, but caused big losses for others as well. 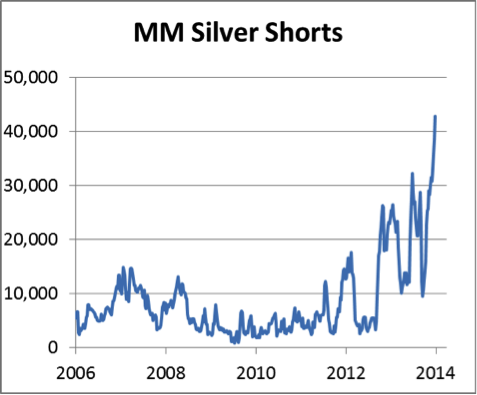 So as I see it, the shorts in silver - and gold too for that matter - are walking on a knife-edge, flirting between the illusion of solvency and collapse. 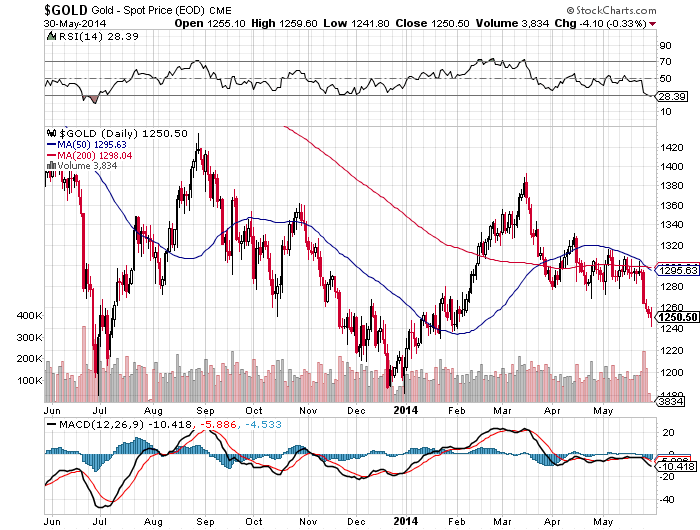 Clearly, the big test for gold will be to clear the $1,312 area. 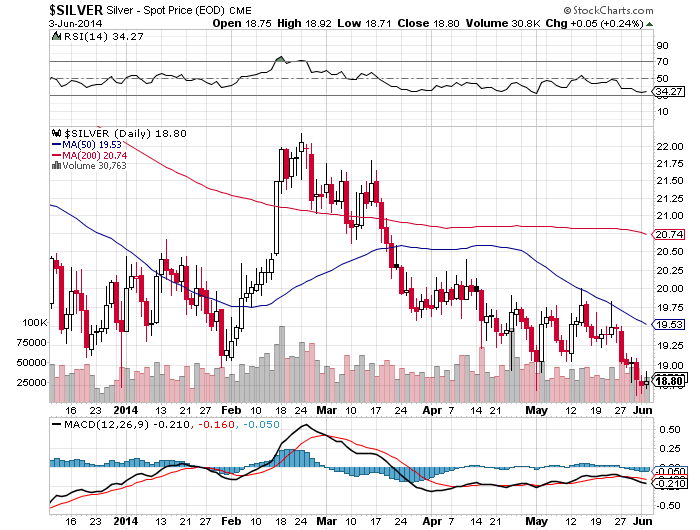 For silver, the big hurdle is around $20.30. It’s time to pay attention and start looking for reversal patterns in price. Är 1888 nästa nivå för S&P 500 eller skall vi ned till 200 dagars. Where are we now? Below is a chart from BCA showing the Fed Funds Rate Cycle. In essence, this chart neatly illustrates what the interest rate cycle imposed by the U.S. Federal Reserve looks like. The red circle indicates where we are right now: Phase IV, also known as the “easing” phase of the monetary policy that was enacted in 2008 in the U.S., better known as quantitative easing (QE). As we know, the Fed enacted QE to stimulate our nation’s economy. Right now we’re benefitting from our placement in Phase IV of this cycle because it is in this phase that the Fed is able to keep interest rates low, keep reserve requirements low and continue printing money. Similarly, when money is “easy,” businesses can find funding for projects and consumers have easier access to credit. Historically, Phase IV (as well as the shift towards Phase I) are the best for equity investors because stocks usually rise during these two positions in the cycle. 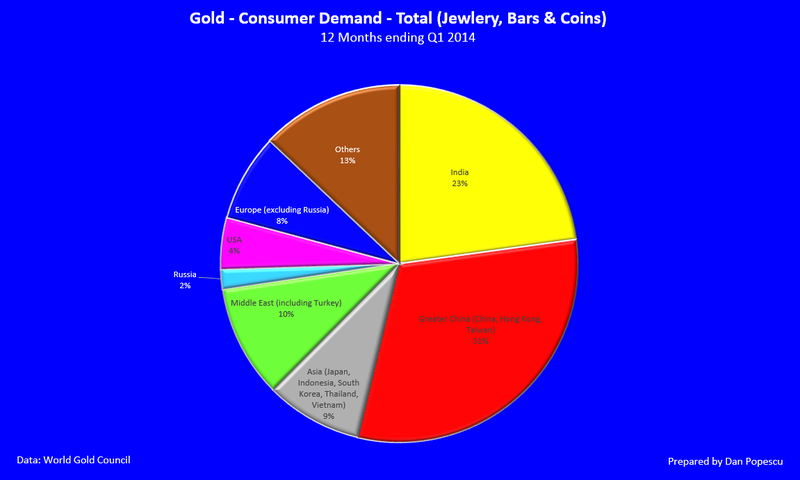 Why these phases are good for gold, too. We have been in Phase IV of the Fed Funds Rate Cycle for a few years now, and are expected to remain here into 2015. Eventually the Fed will have to start tightening again and raise rates, although the numbers should remain relatively low for a while. Once this begins, we will move into Phase I. 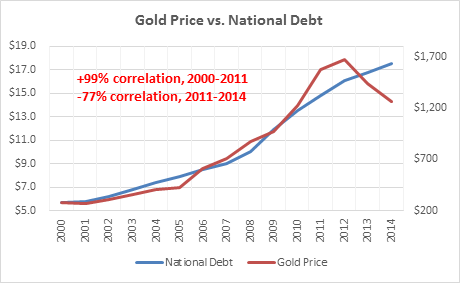 When it comes to the performance of gold and gold stocks, history indicates good times are ahead based on where we are in the cycle. Take a look at the tables below showing median returns during the cycle dating back to 1970 and 1971. You’ll see that for gold and gold stocks, Phase IV and Phase I both show the highest median returns. Note: Excluding the two-month Phase II period spanning the October '87 stock market crash. Har vi nu ett storskaligt krig mellan Sunni och Shia muslimer. Om USA och Iran går in på Shia sidan kommer då Saudi och UAE med flera att gå in på Sunni sidan. Håll koll på oljan. 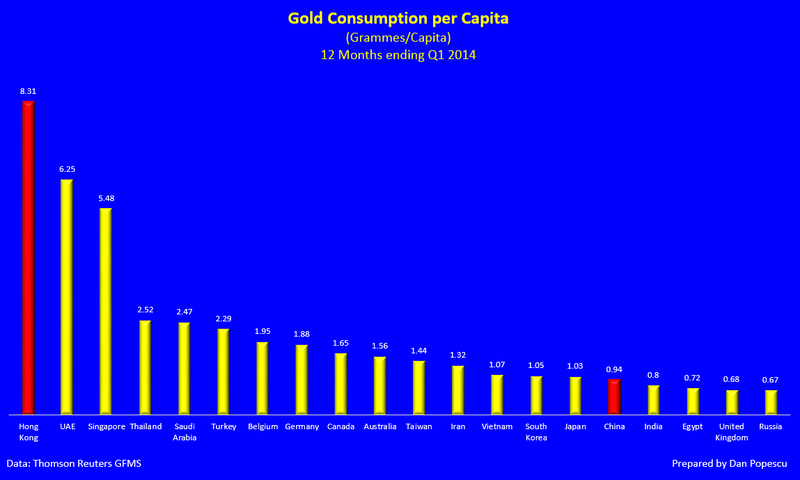 Guld följer inte längre FEDs monetära bas och inte oljepriset. Kommer detta att ändras under andra halvåret i år. The signs are good. With record short positions in gold and silver, hedge funds and algorithmic traders should be worried at the lack of price confirmation: gold is holding well above its bear-market lows and silver is refusing to weaken into new low ground. 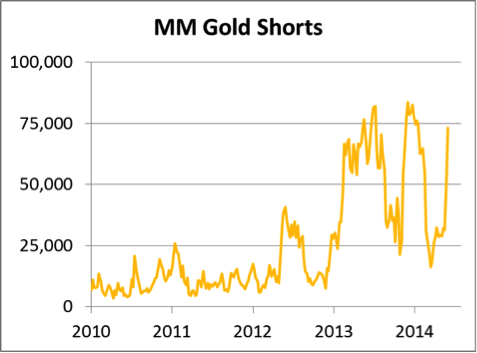 The sudden increase in shorts in both metals amounted to a dramatic bear raid. With gold rising every day this week the squeeze is now on, suggesting in the absence of any new and material factor the current rally should have enough legs to take gold to the $1300 level. 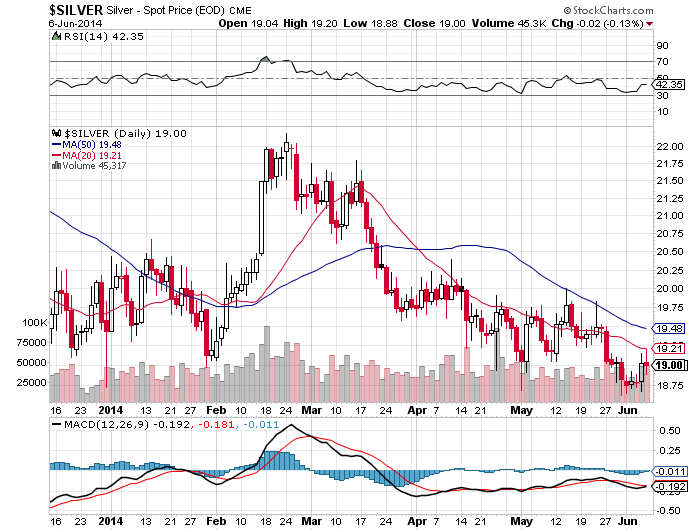 The situation in silver is likely to have a more dramatic outcome, with the caveat that the active July contract is running off the board. 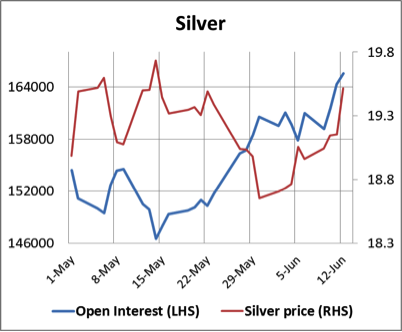 It is notable however that open interest in silver has been steadily growing to near-record levels for the last eighteen months, which tells us that buyers are absorbing everything the bears are throwing at the market. This is shown in the next chart. The big news this week came on Wednesday, when Al-Qaeda affiliated rebels in North-Western Iraq took the cities of Mosul and Kirkuk. In the process they captured a large amount of military hardware and are now well equipped. This morning Iraq's problems appear to be spreading into a wider Sunni insurrection, with Kurdish tribesmen also rebelling against Bagdad rule. Importantly, the Kirkuk-Ceyhan pipeline, which takes oil to the Mediterranean, as well as the Kirkuk Oilfields themselves were first to be affected, and oil prices rose sharply on the news. Indeed, all Iraq's oil production could be threatened. Higher energy price assumptions are likely to influence economists' forecasts of economic growth in US and other markets. 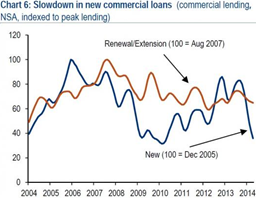 Economists had been downgrading growth prospects already. In the US first quarter GDP expectations have been revised to a contraction of as much as 1.6%, and the Fed's forecast of 2.8% growth for the whole year is now looking too optimistic. 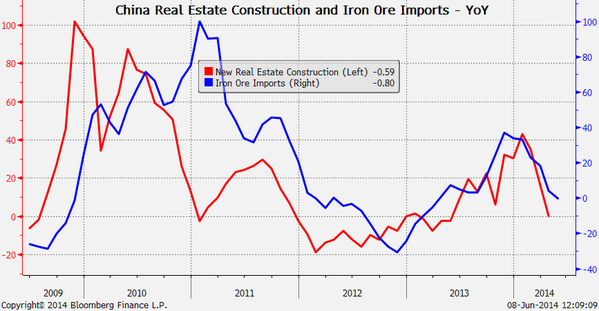 The US is not alone: Japan and the Eurozone are fighting deflation and China is trying to rein in credit growth. In short, the conditions that have led to low bond yields and highly-valued stock markets may be changing for the worse. 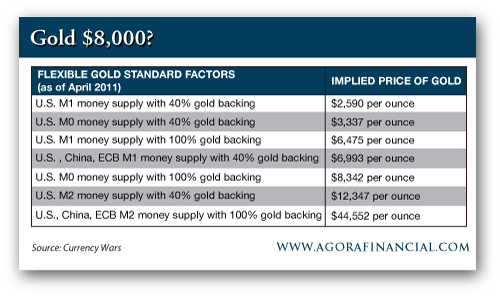 Where this leaves precious metals is yet to be seen, but it is worth bearing in mind that hedge and other funds exposed to losses in bonds and equities will likely reduce their short positions in gold and silver. And if the current weakness in bonds and equities persists, it should be positive for precious metal prices as the bears run for cover. If it seems absurd and illusory today to think that the US dollar could lose its status as the leading global currency, but a look into the history books might help. Portugal (1450-1530), Spain (1530-1640), the Netherlands (1640-1720), France (1720-1815), and Great Britain (1815-1920) were coining leading global currencies for centuries, and have in the meantime lost more or less all of their former monetary splendor. Interestingly, these cycles tend to last about 90 to 100 years, which would also suggest the imminent changing of the guards for the US dollar. "Inflation is an increase in the quantity of money and credit. The symptoms occur in a variety of forms. 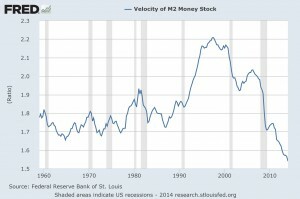 You can print money in the US, but it could happen that it does not boost economic activity in the US but only in China or in Vietnam or Indian and so forth. It can boost wages in India, it can boost real estate prices in London, and so forth, because we have a global economy. Stating there is no inflation is an error." IMF varnar för höga fastighetspriser runt om i världen. House prices “remain well above the historical averages for a majority of countries” in relation to incomes and rents, Mr Zhu said in a speech to the Bundesbank last week, which was only released on Wednesday because it clashed with a European Central Bank announcement. “This is true for instance for Australia, Belgium, Canada, Norway and Sweden,” he said. Lägre BNP ger högre börskurser och därmed en större bubbla. Lite siffror som man bör känna till och därmed förstå vart vi är på väg. Draghi effekten har redan klingat av. Har centralbankernas magi över marknaderna svalnat. Nästa vecka är det dags för FED. Smart Money lämnar börsen och frågan är hur länge kan börsen hålla sig uppe på dessa nivåer. Oljan går upp p.g.a. 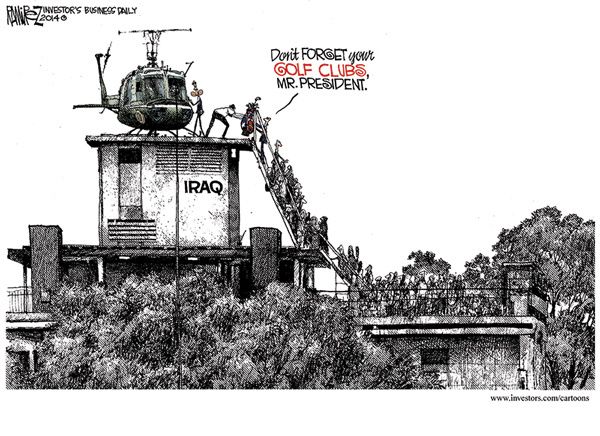 oroligheter i Irak. Det kan bli effekter om man stör infrastrukturen för olje ledningarna i området. Vi har varit här förut och vi vet hur det slutade. När skall guldet börja följa skuldökningen som guldet gjorde fram till 2013. De största bankerna i USA minskar sin utlåning under Q1. Eftersom vi har en tillväxt som bygger på lånade pengar så måste trenden vända om vi skall få någon tillväxt under Q2. Lägre tillväxt ger högre börskurser. Världens största pyramidspel är ett faktum. There is much hope that after a dismal Q1 GDP report of -1% annualized growth in the domestic economy, that Q2 will see a sharp rebound of between 3-4% according to the bulk of economists. The Federal Reserve is predicting that the U.S. economy will grow as strongly as 2.8% in real terms for the entirety of 2014. The achievement of the Fed's rather lofty goal would require a real 4% annualized growth in each of the next three quarters. The problem with this assumption is that the last time that the U.S. economy grew at 4% or more, over three consecutive quarters, was in 1983. Vi närmar oss nu slutet på ekonomisk framgång med hjälp av skulder. Från 1971 då guldet lämnade det monetära systemet har skulderna ökat exponentiellt. Börserna är på topp men i flertalet länder upplevs den ekonomiska situationen som bedrövlig. Kingworldnews har charten som visar hur positiv inställningen till börsen i USA är. Enligt COT rapporten så är det upplagt för en större uppgång i silvret. Bankerna har inga stora korta positioner medans Hedge fonderna inte har några långa positioner. Turning now to the COT charts we can see the dramatic improvement in the COT structure on the chart below, with Commercial shorts falling to the sort of levels that prevailed ahead of the big rally last August, and the more muted but still significant rally of last February. Large Spec longs are now almost non-existent – they have “thrown in the towel” which is very positive sign indeed. 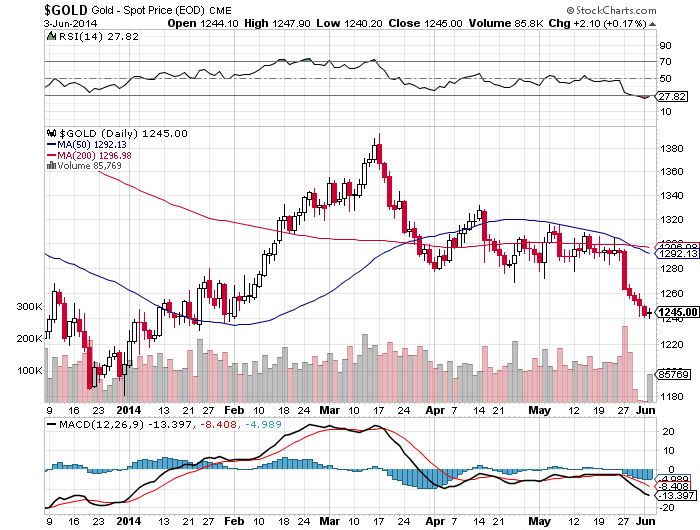 This is a very positive COT structure indeed and the expected new uptrend could begin at any time, although we suspect there may first be a short-term drop, partly because gold’s technical situation could still use some improvement, and partly because seasonal factors are not favourable this month. Silvret befinner sig nu i den långsiktiga köpzonen samtidigt som vi går in i en bra period för silverpriset. USAs totala skulder är på väg över $60 trillions vilket skall sättas i relation till landets BNP om ca $17 trillions. Girigheten på börsen är nu nästan så hög den kan bli samtidigt som blankarna av aktier har kastat in handduken. det här kan bara gå åt ett håll. Kan det bli mycket lägre långräntor än så här. 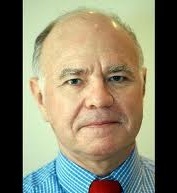 Marc Faber, publisher of the Gloom, Boom & Doom report, remains bearish on U.S.stocks, seeing valuations as stretched. "I don't regard this as a very healthy market," he told CNBC. 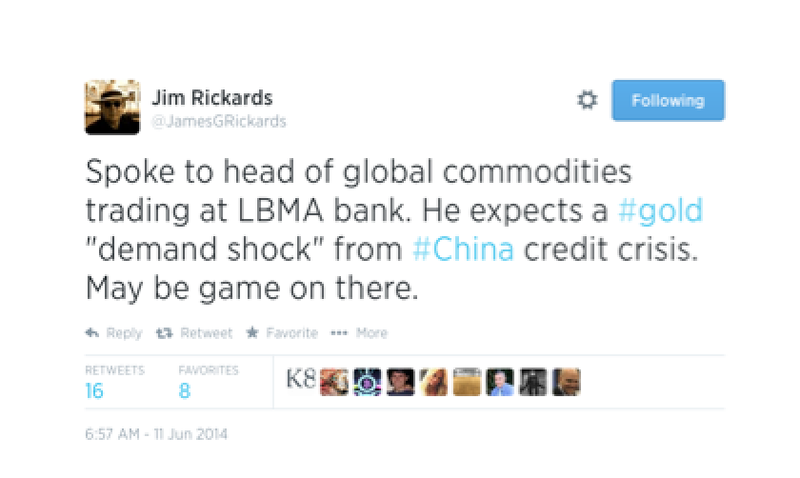 "The U.S. market is in a very dicey position where it could easily drop 10, 20 percent." The Standard & Poor's 500 index rose 4.46 points, or 0.2 percent, to close Thursday at 1,892.49, within 1 percent of its record high. The index is up 2.4 percent for the year. The index' trailing price-earnings ratio registered 18 as of Friday, according to Birinyi Associates. That's above its historical average. Faber isn't too enthusiastic when it comes to Treasurys either, saying there is "nothing attractive" about them. The 10-year Treasury yield stood at 2.55 percent early Friday, after hitting a 6 ½-month low of 2.47 percent last week. While acknowledging that U.S. stocks are "relatively expensive," he noted that Europe and emerging markets offered better value. "If I were to buy equities I would rather go into emerging economies, but I don't think there is a hurry." 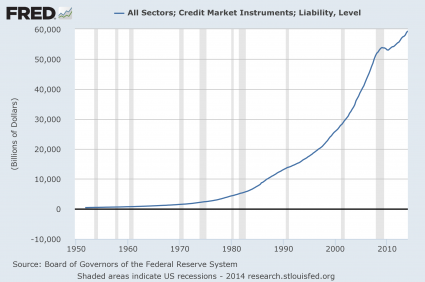 "I think we are bracing for a general asset deflation," Faber stated. "I think the system is still very vulnerable. 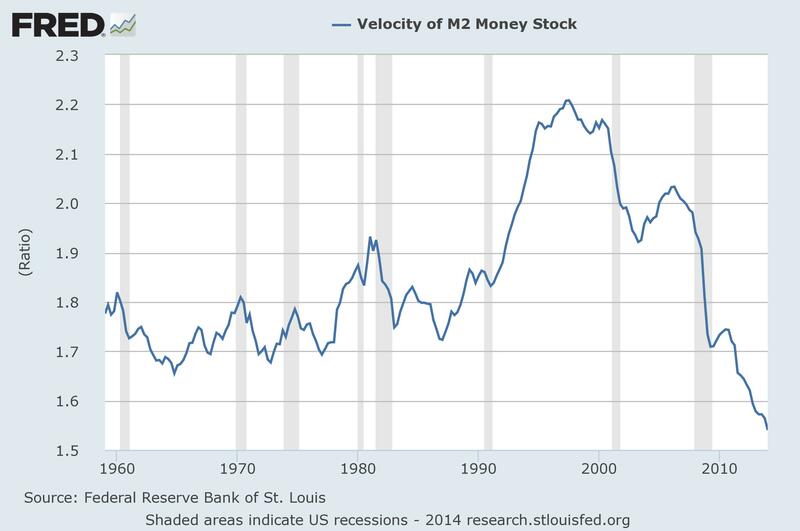 I'm not predicting a complete collapse, because money printing can go on almost endlessly. But it will have unintended consequences." Spanska 10-åringen är nu på samma nivå som USAs 10-åringen. Är det någon som tror att allt är som det skall. With a closing P/E ratio over 17 and a VIX under 11, Deutsche Bank's David Bianco is sticking with his cautious call for the summer. Their preferred measure of equity market emotions is the price-to-earnings ratio divided by the VIX. 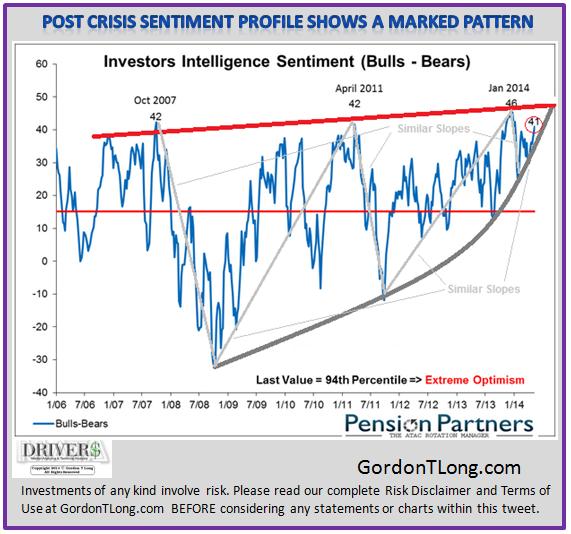 As of Friday's close, this sentiment measure has never been higher and is in extreme "Mania" phase. Deutsche's advice to all the summertime-'chasers' - "wait for a better entry." När skall vi söderut och vad är det som får det att vända??????????? Härifrån kan det bara gå åt ett håll och det är mot mer stress i marknaden. Precis som innan förra krisen. Utvecklingen för EU går åt fel håll men börserna tickar på uppåt med hjälp av ECB som tillhandahåller billiga pengar. Hur länge till kan detta pyramidspel fortgå? japan levererar bra BNP för Q1 men det beror på ökad konsumtion före momshöjningen. Vis er ett stort tapp för konsumtionen för Q2. Världens långräntor är nere på rekordlåga nivåer samtidigt som ekonomin skall vara på väg uppåt. Det är något som inte stämmer och måste ge vika. It is a Fools Game in Disguise! Företagens vinstmarginaler toppar och drar med sig börserna nedåt. For that you need to look at another measure of corporate profits—real-time reporting of all S&P 500 companies (shown below)—for further confirmation. As you can see, the 12-month trailing profit margin of all S&P 500 companies serves as a much better coincident timing indicator of market peaks and, as well, a more imminent red-flag of economic recessions. After last weekend's schizophrenic expanding (official) / contracting (HSBC) Manufacturing PMI, China's Services PMI printed at 50.7 - its lowest since August 2011, as the business expectations index dropped to an 11-month low. The Composite PMI improved (after 3 months of contraction) but most notably, the composite employment declines at the fastest pace since Feb 2009. What is perhaps most worrisome is, as Markit notes, "The latest survey signalled the second-weakest degree of optimism since the series began in November 2005." There are three big international factors that are pressuring the dollar right now – Russia, China, and Saudi Arabia. “Since the 1970s, Saudi Arabia [has been] the leader in what’s called the petrodollar. It basically means that Saudi Arabia and, by extension, OPEC, price oil in dollars, so the world market is in dollars. 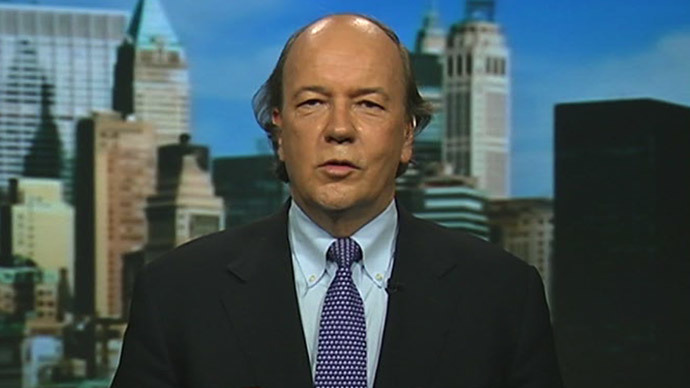 The threats to the dollar are “ubiquitous,” the author states in his book. The only way the US can pay off its $17 trillion debt is with inflation, which would drive other countries away from the dollar while the accumulation of gold by Russia and China presages the shift to a new reserve asset. 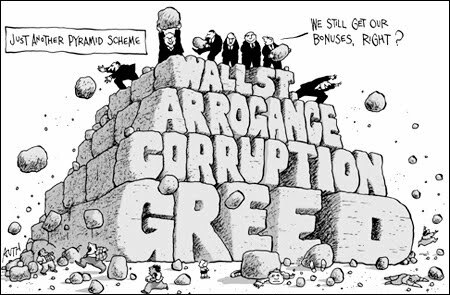 “The next time we will have a liquidity crisis in the world it’s going to be bigger than the ability of central banks to deal with it. The IMF will basically have to bail out the world by printing the SDRs (an international reserve asset created by the IMF in 1969 to supplement its member countries' official reserves). By that time, you will see the SDR emerge as the new global world currency,” . Produktiviteten under Q1 föll mer än väntat samtidigt som vi fick ett större underskott i handelsbalansen under april. BNP för Q2 kan nu få svårt att leva upp till högt ställda förväntningar. At 16,817, wave A and C are equivalent—this is the highest probability target using a three-wave approach; but obviously it is no Holy Grail. “Nobody rings a bell at the top.” “Top picking is a mug’s game.” But, this technical analysis suggests we are getting very close to a major top. Also notice on the chart (below) the interesting divergence pattern between price and momentum we saw last time we got a decent correction back in 2011. VIX hade en liknande utveckling innan förra finanskrisen. Vinsterna stiger men företagens tillväxt är mycket måttlig. Hur länge till kan detta fortsätta. Since 2009, the reported earnings per share of corporations has increased by a total of 230%. This is the sharpest post-recession rise in reported EPS in history. However, that sharp increase in earnings did not come from revenue which is reported at the top line of the income statement. Revenue from sales of goods and services has only increased by a marginal 26% during the same period. This is shown in the chart below. Marknadens förväntningar på vinstutvecklingen är alldeles för höga och måste justeras ned hela tiden samtidigt som börsen fortsätter sätta rekord. Hur länge kan detta fortgå. Guldets värde enligt Jim Rickards vid olika beräkningar för papperspengarnas uppbackning med guld. ECB ser trenden mot deflation och kommer med åtgärder på torsdag. HSBC PMI data för Kina håller sig fortfarande under 50 vilket tyder på att det är svårt för den kinesiska ekonomin att ta fart. För den som följer PMI som guidens för ekonomin så ser det inte så bra ut. 2/3 trendar nedåt. Silvret är fortfarande den mest sålda råvaran på termin. Marknadens förväntningar inför ECB mötet på torsdag. Mycket är redan diskonterat.